Observation - Chromatomyia scolopendri - UK and Ireland. 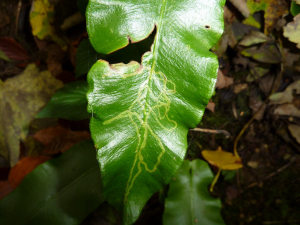 Description: Leaf mine of Chromatomyia scolopendri in Hart's-tongue Fern. Leaf mine of Chromatomyia scolopendri in Hart's-tongue Fern.